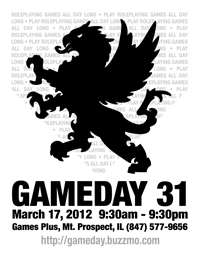 As promised, here is the official flyer for Gameday 31. Even in this age of social media, a little print media can go a long way. Feel free to print this out and post it anywhere that is both legal and appropriate.